Gary Root was sworn in as mayor of Stronghurst by Clerk Lou Ann Nortrup at the May 6th village board meeting. Betty Waterman and Mike Bohnenkamp also took the oath of office as trustees. 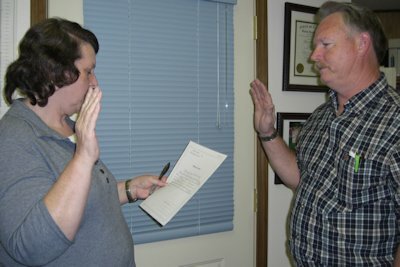 David Vancil, the other trustee, to win the election was not present to be sworn in. The meeting opened with Mike Bohnenkamp presiding in the absence of Eric Chockley, at 7:00 p.m. and the trustees approved last month's minutes and paying of the bills. The meeting was then adjourned sine die until after the swearing in of the new officers. The meeting re-opened under the guidance of Mayor Root. Now that the vote on selling package liquor has passed, the board needs to establish an ordinance for the control of this endeavor. Attorney Bill Rasmussen told the board, "Take your time and do it right the first time so we do not have to revamp the ordinance." A few of the items that need to be decided include: what to charge for the license, what type of liquor can be sold; can it be sold on Sunday; what time can they start selling and what time of day do they stop selling; where can it be sold because of zoning; etc. Rasmussen suggested a committee be formed to study the issues and bring their recommendation to the board. He suggested they get liquor ordinances from surrounding villages to review what others villages do. Rasmussen indicated the mayor, by law, is the liquor president and will grant the license, but the board will vote on them. Deb Hale, Tony Anderson, Betty Waterman volunteered to serve on the committee. Rasmussen advised, since this was a hot topic, they needed to do their meetings right, advertise, open meeting, the whole nine yards. He also suggested inviting those who might be applying for a license to come to meeting and get their input also. The police report for the month of April included: 129.5 hours worked; 20 training hours; 714 miles on the squad car; 4 service calls; 2 agency assists; 1 village ordinance ticket; and 18 business courtesy checks. Ronnie Gittings thanked Eric Chockley and Amanda Kane for their service on the board and welcomed Gary Root and Betty Waterman, thanking them for being willing to serve. Two bids had been received for the removal of two trees. The board chose J & J Tree Service for the job at $600. Two bids had also been received for seamless gutters for city hall and the bid went to Bill Carlson of Biggsville for 681.50. Gittings will get information on having the computers at the water plant and at city hall upgraded to Windows 8. Gittings reported they would like to put in one new fire hydrant and two or three new valves this year. The new valves are being installed to allow for only a couple of village blocks be shut off from water instead of shutting off the whole town when the need arises. Sally Waddell and her district underwriter attended the meeting to explain the insurance policy and what the coverage is for the village. Brendan Schaley asked the board to support the ball field in Stronghurst. Chuck Vaughn has acquired the old lights from Burlington Community Field and they will be installed on the softball diamond. The building committee members, Mike Bohnenkamp and Tony Anderson, will decide what to do with the rest stop triangle on the highway. Root would like a suggestion or comment box placed at city hall, so the public could have an input of ideas. It was decided the water bill slot could be used for this purpose and not have to install another box. Root said when you come into town a couple of the houses look pretty shoddy and he inquired if there was anything that could be done. He was told there is an ordinance to cover the problem. After some discussion it was agreed the police department would enforce this ordinance instead of forming another committee. Root asked about hiring a boy and a girl for summer help. It was decided to take applications. There has been no word on the grant that was written for the water spray park. Root asked if there was a lot of culverts in town that are plugged. It was agreed there is a lot of them plugged and needs worked on. The fire department has two nozzles that works well on cleaning them out but they would need volunteer firemen to do the work. Clerk Lou Ann Nortrup asked to attend a "class for clerks" in Springfield on June 20-21. She would be taking classes on filing ordinances and resolutions, throwing away old papers, etc. The board approved her doing this and will pay for the classes, motel, mileage and food. An audit will be set up for June. In attendance were: Mike Bohnenkamp, Deb Hale, Tony Anderson, Betty Waterman, Brendan Schaley, Lou Ann Nortrup, Ronnie Gittings, Mike Nelson, Amanda Kane, Fern Fude, Attorney Bill Rasmussen, Sally Waddell, Arbry Vancil, Shirley Linder. 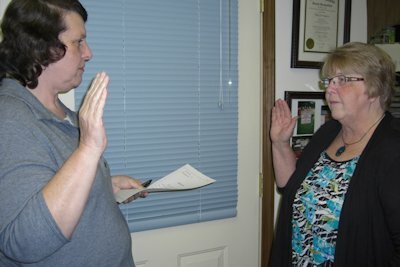 The next meeting will be held on Monday, June 3, 2013 at 7:00 p.m.
Lou Ann Nortrup, Village Clerk, swears in the newest elected officials on the Stronghurst Board: Mayor Gary Root and Trustee Betty Waterman.